while working from my home studio in Middlebury, Vermont from 2009 to 2012, I enrolled in the CVPS Cow Power program . All of the energy used in my studio, including the firing, was produced in a renewable fashion. My power company offered electricity generated from methane collected from dairy cow droppings, therefore decreasing the release of this harmful greenhouse gas into the atmosphere and decreasing use of fossil fuels. For more information check out CVPS Cow Power. CVPS Cow Power named Utility Green Power Program of the Year by the US Department of Energy. 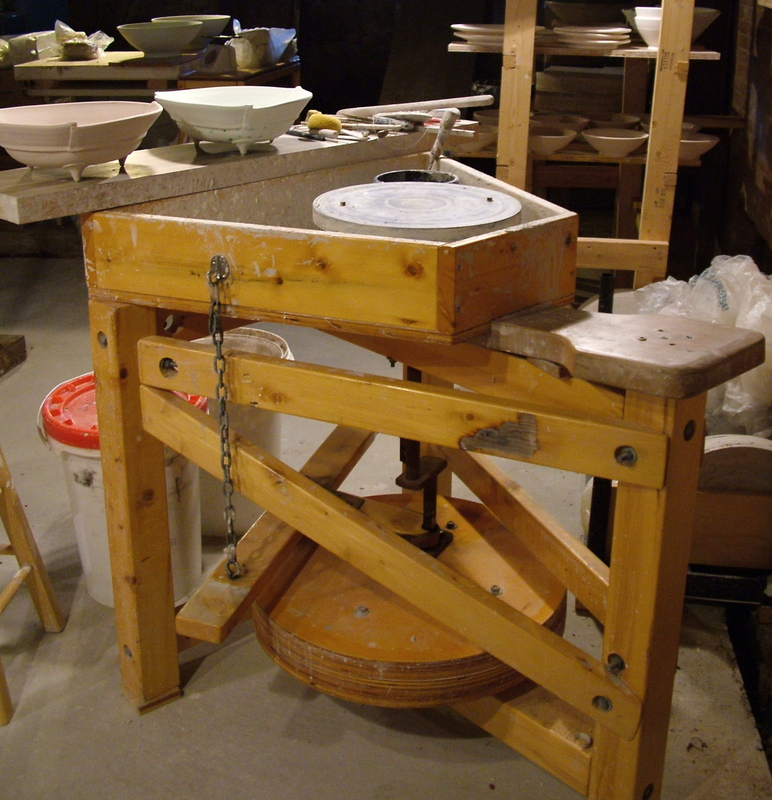 When I entered the ceramics studio at UNC Greensboro in 1994, kick wheels were the only option. I came to love their quiet slow rhythm and the connection to traditional ways of working. I was introduced to the treadle wheel in 1999 at Penland School of Crafts. The following year I enlisted my father-in-law, Chuck Rhynard, to mentor me through building the one pictured above which I continue throwing on today. I use a mixture of reused and new packing materials for shipping. I have a couple of sources who supply me with styrofoam peanuts. I use newspaper and cardboard to pad individual pots. While I use recycled boxes when I can, I also purchase new boxes that fit inside each other properly since most shipments need to be double boxed for extra protection. Last, I must confess that tape is very difficult to reuse, hence I buy new packing tape.